Vincent David Lyon was born in Rainhill on 12th November 1895, the 5th son of Nathan and Annie Lyon. He was baptised on 2nd February 1896. The 1911 Census shows Vincent, aged 14, working as a Post Office messenger and living at Ashdown Terrace with his parents, four elder brothers and two younger sisters. He enlisted in Warrington, aged 18, and his regimental number, 2016, was issued to the 1/5th Battalion of the Prince of Wales Volunteers, South Lancashire Regiment on 4th August - the day on which war was declared. However, at some point he transferred to the 10th (Reserve) Battalion. This had been formed in Crosby and moved to Heswall later in the year. 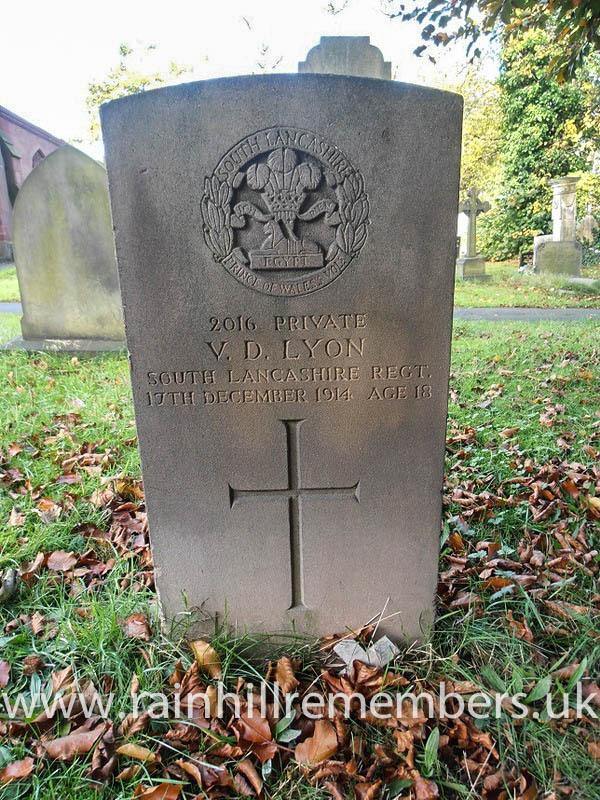 He died on 17th December 1914 at the military hospital in Seaforth and was buried in St Ann’s Churchyard, Rainhill, two days later. See Vincent's record on the Commonwealth War Graves Commission (CWGC) website. It is interesting to note that his name is shown as Victor rather than Vincent. Note the discrepancy in ages on the gravestone and the Burial Index. The burial record from St. Ann's Church Rainhill showing the Vincent died in Seaforth Military Hospital but was buried in Rainhill aged 19.